I recently came across an excellent little Japanese grocery store on my route to yoga. One step inside and I felt as if I had been transported to Tokyo. Now every time I walk by, it is next to impossible for me not to stop in and explore the various onigiri, pastel mochi’s, fresh daikons from Japan, and the assortment of miso pastes and other fermented delicacies. This routine stop inspired this recipe for DIY hand rolls with Shiso and Yuzu Tofu. Three ingredients in this recipe may prove to be difficult to find in your average grocery store: Yuzu juice, shiso leaves, and Shichi-mi tōgarashi, but they are definitely worth hunting down at your local Japanese market. You may even have luck in Chinatown. Yuzu is a citrus fruit with a tart flavour that resembles a grapefruit with the overtones of a mandarin orange. You can find yuzu juice in the condiment aisle. If you are super lucky you will find the fresh fruit. Another unique flavour are shiso leaves (also named perilla leaves). Shiso is part of the mint family but taste very different with citrus flavour notes. This little leaf makes all the wonderful difference in a recipe. Shichi-mi tōgarashi is a common Japanese spice mixture that is used as a seasoning. A typical blend may contain red chili pepper, orange peel, black sesame seed, poppy seed, and nori. It’s a pretty seasoning and it brings the heat. If you need a tasty and healthy recipe to whip up for friends, this is it! It’s unique, engaging, fun, and easy to prepare. You can even cook the rice and tofu ahead of time and just heat before serving. I think sushi tastes exceptionally better when the rice is warm. Prepare the tofu. Begin by pressing the tofu to release the liquid. Sandwich the tofu between a few sheets of paper towel. Place a heavy weight, such as a couple of glass bowls or a tin of tomatoes on a plate and place on top of the tofu. Allow the tofu to drain excess liquid for about 15 minutes. Begin the marinade. Combine the tamari, rice vinegar, and yuzu juice. Slice the tofu into about 2” x 1” long pieces and marinate in mixture for at least 30 minutes. Combine rice with 1 2/3 cups of water in a medium saucepan with a tight fitting lid. Bring to a boil and then simmer for about 20 - 25 minutes until water is absorbed and rice is tender. Whisk together the rice vinegar, honey, and salt. Add to the cooked rice. Heat 1 tbsp of coconut oil in a medium saucepan over medium high. Remove the tofu from the marinade and and pan fry each side, rotating until golden, about 5 minutes. Splash a little extra yuzu juice. To serve, make a spread of all of the ingredients. 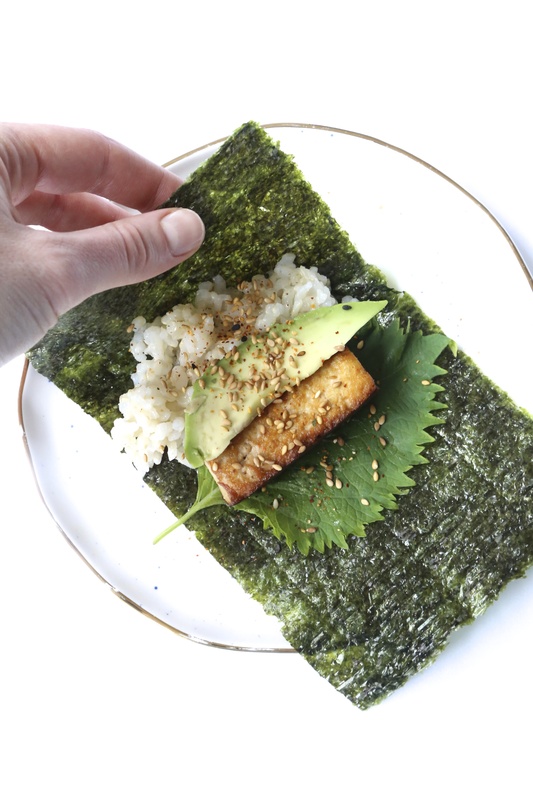 Take a piece of nori and layer with a small amount of brown rice, 1 shiso leaf,1 slice of avocado, a piece of tofu and garnish with sesame seeds and togarashi. Roll up and enjoy! This entry was posted in Main Dishes and tagged gluten-free, japanese, plant food, plant-based, Vegan, Vegetarian. Bookmark the permalink.